For 13 years Phil Jones Bass has been building bass amplifiers for the most demanding bassists. This time he looks into the most cost effective way to build an amp without sacrificing the most important aspect: TONE! The Session 77 is loud enough to work with most drummers and compact enough to be carried around. The two super high-efficiency and proprietary 7-inch speakers were designed by Phil Jones to get the most of the 100 watts class D amplifier. These two proprietary woofers are complimented by a high energy 2-inch K high frequency transducer. This tweeter has been used in thousands of other PJB PA speakers and have proven to be nearly blown proof. The response of this speaker system is of the highest fidelity from 30Hz to 20KHz, which means it does not only sound great with bass guitar but any instrument that plugs into it. 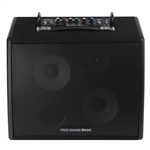 It is a single channel bass amplifier with100 watts output. By using all digital circuitry the amp will work on any AC voltage from 100 to 260 Volts without the need of a voltage selector. Digital circuits are far more efficient that the old analog counterparts and the benefit is less wasted power as heat, thus giving the amp a greater longevity. The Session 77 is also fitted with a solid kick proof acoustically transparent, curved steel grill. It uses the same level of quality parts found on all PJB amps. by focusing on the most basic needs of most bass players, PJB achieved the goal of having the best sounding, most reliable amp at an unbeatable price.